2015, you've been wonderful, hard, tiring, exciting, life changing, challenging, financially tough, progressive, rewarding and to be honest, one of the best. 2015 started off with finding out we were expecting baby number two. It had taken us seven months of trying, so when I got that positive test in January I was over the moon that our little family was growing by one more. As pregnancy symptoms sunk in life plodding along as normal. Darcie turned three in June and then we soon found out we were having a little boy. Darcie was going to have a brother! Jamie got an amazing promotion at work, the job he had always wanted and worked so hard to get. This little blog grew, I managed to get more work and I won Next's blogger of the month for October and got "Top Blog"in Essentials magazine in the December issue. All in all, our career's seem to be blossoming. September came and our beautiful boy was born. All 8lb 11oz of him was completely and utterly perfect and the added bonus was that I got to experience birth exactly the way I wanted. These last three months have been some of the best in my life. Knowing our family is complete and looking ahead to our future as a family of four. 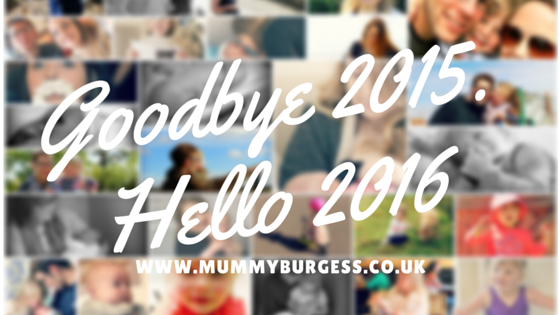 What do I hope and wish for 2016? Health, happiness and adventure. I will be going back to work in a few months, Darcie will start school in September, Henry will celebrate his first birthday and me and Jamie will celebrate 10 years of being an item. 2016 has the potential to be another wonderful year. So as me and Jamie have tucked up the children in bed, we settle down with a box of chocolates and pretend wine (as I'm breastfeeding!). Some may find that an incredibly boring to see in the new year, but I wouldn't have it any other way. Happy New Year all, I hope 2016 brings you all you hoped for.